Lowell Brauser has taken his 30 years of creativity and experience to create beautiful outdoor living spaces. 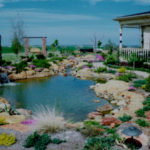 Lowell holds a degree in Landscape Architecture from Oklahoma State University which perfectly compliments his passion for landscaping, art and design. He has created modern new construction projects and brought new life to existing landscapes.